A first-of-its kind water coaster that sends guests racing above the upper decks of the ship. An animated turtle that engages children in conversation about life in the ocean. A sophisticated lounge where the sun sets over the skyline of a different world-famous city each night. 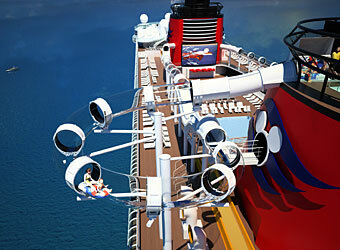 When the Disney Dream debuts in early 2011, the newest ship in the Disney Cruise Line fleet will bring to life these innovations and more. The Disney Dream will take family cruising to all-new heights, embracing the spirit of innovation, magical family entertainment and immersive experiences that have made Disney Cruise Line the preeminent cruise of choice for families since 1998. 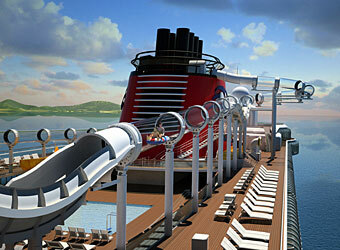 Disney Cruise Line revolutionized the cruise industry with purpose-built ships designed just for families. With the Disney Dream setting sail on Jan. 26, 2011, preparations are underway to expand the one-of-a-kind family experience, utilizing technology to enhance the world-class entertainment and legendary guest services onboard. From stem to stern, the Disney Dream will offer a cruise experience that caters to the preferences of the whole family. AquaDuck Water Coaster. . .
Disney Cruise Line debuts a cruise-industry first: a shipboard water coaster … AquaDuck! Guests aboard the Disney Dream will get swept away on an exhilarating high-speed flume ride featuring twists, turns, drops, uphill acceleration and river rapids – all while traversing the upper decks of the ship. AquaDuck stretches 765 feet in length – more than two and a half times the length of a football field – and spans four decks in height. Guests slide 13 feet over the side of the ship in a translucent “swing out” loop allowing them to look down on the ocean 150 feet below. Guests experience coaster-like thrills as high-powered water jets push them upwards and forwards at 20 feet per second. AquaDuck continues through the forward funnel, encounters a 335 foot stretch of river rapids and splashes down to an end on Deck 12. 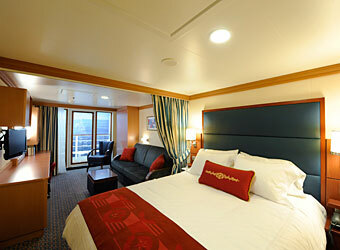 A Virtual Porthole for Inside Staterooms. . .
Disney Cruise Line introduces another stateroom innovation with all inside staterooms on the Disney Dream featuring a Virtual Porthole that provides guests with a real-time view outside the ship. High-definition cameras placed on the exterior of the ship feed live video to each Virtual Porthole. As guests observe the impressive outside views, they may glimpse a magical surprise: animated characters such as Peach the starfish from the Disney•Pixar hit film “Finding Nemo,” or Mickey Mouse may pop by the Virtual Porthole. A Magical Oasis for Children. . .
At Disney’s Oceaneer Lab, children feel as though they are embarking on a great seafaring adventure in a room filled with maps, maritime instruments and swashbuckling artifacts. Here, children can try their hand at animation, become a pop star or navigate ships through digital seas. Both venues offer magical interactions with the animated characters such as Crush, the sea turtle from the Disney•Pixar motion picture “Finding Nemo” and Stitch, the mischievous alien from “Lilo and Stitch.” The characters chat, play and joke with children in live, unrehearsed conversations from their digital undersea and intergalactic environments via 103-inch plasma screens. Chill-Out Zones for Tweens and Teens. . . Located inside the forward funnel is Edge – the lounge just for tweens (ages 11 to 13). This tween pad is filled with a multitude of hi-tech entertainment including the ability to create and star in photo postcards and video karaoke using green-screen technology. Teens have their own exclusive club aboard the Disney Dream with Vibe – a trendy and inviting indoor/outdoor space created especially for guests ages 14 to 17. A “teen-only” swipe card provides access to the nearly 9,000-square-foot club. Teens can create and edit videos, play computer games, access the onboard social media application or try their hand at spinning and mixing dance tracks. Teens have their own private outdoor deck area with chaise lounges for sunbathing, two wading pools, misters and pop jets for cooling off, and deck games such as ping-pong and foosball. Personal Touches with Rotational Dining. . .
Enchanted Garden, a whimsical, casual restaurant inspired by the gardens of Versailles and featuring a dining environment that magically transforms from day to night. Just for Adults. . .
On the Disney Dream, while children are having the time of their lives in the elaborately themed youth areas, adults can look forward to incomparable indulgences and relaxation with exclusive areas and offerings designed exclusively for them. 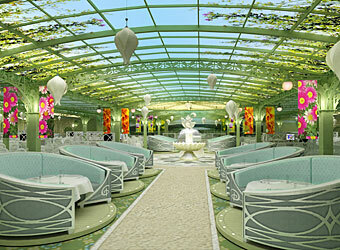 Adults can escape into The District, a nighttime entertainment area on the Disney Dream with five unique venues. This playground for grownups features sophisticated lounges, each with its own unique design, look, feel, and palate-pleasing delights. Senses Spa & Salon offers adult tranquility with 17 private treatment rooms, lavish spa villas with indoor treatment rooms and private outdoor verandahs, and Rainforest, a special section of the spa offering the benefits of steam, heat and hydrotherapy to relax the mind and body. At Palo, adult guests find epicurean excellence and an unforgettable dinner experience at sea. Every seat offers beautiful ocean vistas while a pianist softly serenades guests in an intimate restaurant setting. The water-coaster looks like a blast. What a great new idea’s for inside and outside activities!